There are only three beautifully crafted three bedroom residences available in Edition, with floor areas ranging from 218 sq m to 247 sq m. Apartment 3B is priced at $4,695,000 NZD (included are media room, 2.5 bathrooms, storage unit and secure car parking for a minimum of two vehicles) and features generous 28.9 sq m balcony that connects to the outdoors. The design of Edition is referenced in the apartment's kitchen islands, which are beautiful stretches of mitred stone with cantilevered ends. Warm-toned, grey fumed oak cabinetry conceals high-end appliances from view, and complements the pietra grey marble splashbacks. Discerning cooks will appreciate the Miele ovens and induction cooktops, along with the Miele dishwashers. All apartments also feature Bosch fridge-freezers and Italian tapware in the main kitchen spaces (and in the sculleries featured in some apartments). Large travertine tiles, double sinks and Italian tapware are standard in all bathrooms and lend a luxuriousness to the interiors. The master bedrooms are designed as calming retreats. Edition is home to just 19 residences, contemporary, thoughtful spaces created with flexibility in mind. These beautiful, spacious environments designed by architects Monk Mackenzie with un-rivaled interiors by Bureaux, form a cutting edge masterpiece that has recently been recognized as a finalist at the World Architecture Festival. The exterior facade, encased in Italian-made glass brick, will surely be the envy of many. 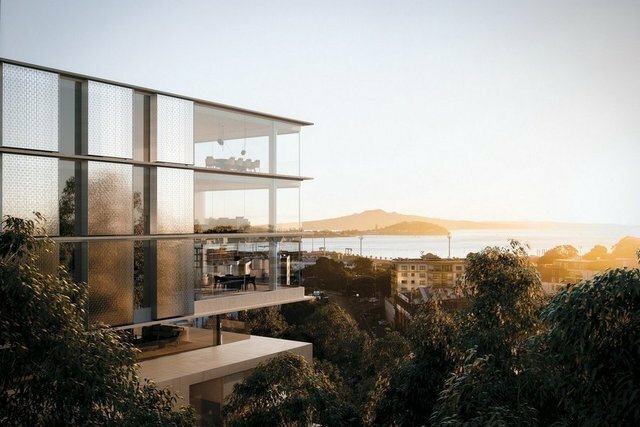 The upper three levels are cantilevered above the ground and enjoy a vista of sky and water, with views over the Hauraki Gulf to the north and east, while on the lower levels, floor-to-ceiling glass emphasizes the high stud and allows for an abundance of natural light. At home in Parnell, you're just a few minutes stroll to Auckland's design precinct, home to high-end furniture showrooms, architecture studios and art galleries along with some of the best restaurants and cafes in the city. Winner of The Chicago Athenaeum Architecture Award. Visit editionparnell.co.nz for more information or contact us for a private viewing.